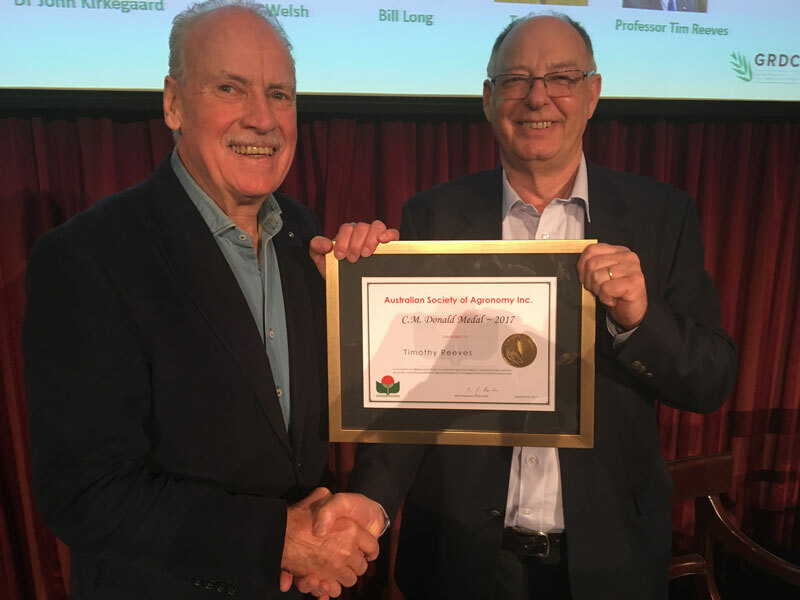 In place of our usual opinion piece this month, we are pleased to be able to present the key messages by our board member, Professor Timothy Reeves, the recipient of the Australian Society of Agronomy’s most prestigious award, the C.M. Donald Medal for Agronomy, for his distinguished career in agricultural research, development and extension, focussed on sustainable agriculture in Australia and overseas. The medal commemorates Colin Malcolm Donald (1910 – 1985), an agronomist who profoundly influenced pasture development in Australia by understanding the limitations to pasture growth imposed by soils and environment, and advanced our understanding of competition between plants when grown in communities. Tim’s Donald Oration was just presented at this year’s 18th Australian Society of Agronomy Conference on 26 September in Ballarat. For the purpose of this short piece for our newsletter, excerpts from his address are provided, with a focus on suggested lessons learned through Tim’s 50 year career and their current relevance in the pursuit of sustainable agriculture, and his recommendations around the ‘Grand Challenges to Global Food and Nutritional Security’. In starting his oration, Tim explained that he did not grow up wanting to be an agronomist and did not know what one was until he left university. However, he notes that by great fortune he did become an agronomist in 1967 and to this day still introduces himself that way – “I am an agronomist” – and is very proud to do so. The basis of good agronomic research is the establishment of first-class experiments utilising the very best techniques so that the measurements made are indeed based on valid comparisons of the systems/treatments being evaluated. This requires the efforts of multi-skilled teams comprising specialist experts who all bring their knowledge and expertise to the work. Unfortunately, in recent years I have seen an increasing amount of field based research which has been of a very poor standard and despite the use of sophisticated monitoring and measuring equipment – often extremely costly – could not deliver accurate and meaningful results as the basic comparisons were flawed. If two systems are to be compared, then it is essential that each is established and managed using best management practices that accurately represent the situation in the best farmers’ paddocks. Sophisticated digital measurements are not a substitute for the accurate and rigorous establishment of first-class experiments. There appears today to be a much greater reluctance to invest in human ‘potential’ and to take a calculated gamble that ‘rising stars’ will grow into the job and more than reward the confidence shown in them. Quite often I have been recently involved with, or am aware of, selection processes at universities or other institutions, where an appointment is not made, or is offered at a lower level (and often as a result, not accepted) because none of the candidates were deemed to have fully satisfied the selection criteria. We are in an age where it is notoriously difficult to get good, senior people to move for a new job, but young ambitious people are much more mobile. It is therefore critical that the best of these are recruited and supported so that they can achieve at the high levels required and hopefully beyond, within a year or two of their appointment. We must again be prepared to invest in potential, if we are to get the succession that agronomy and other agricultural professions require! Make time for younger agronomists and visitors – do not underestimate the importance of visiting, and being visited, both in the knowledge exchange process and in the career development of younger scientists. The continuing participation of farmers in the research-development-extension continuum is absolutely vital. This is important for all aspects of research but essential for successful agronomic research. Researchers are now less likely to live in the communities that they serve and therefore new modalities and efforts are required to foster full farmer participation in research, including such mechanisms as steering and industry advice groups. No one research team has a monopoly on good ideas and the exchange of ideas and material helps everyone and ensures greater progress. Whilst the National RDE Strategy has some strong merits in terms of rationalising integration and cooperative efforts, there is still a place for rational duplication and competition, in order to emphasise urgency, disrupt uniform thinking and avoid complacency. There are different aspects of new technologies and adoption is best stimulated when the aspects of most relevance and value to individual growers are clearly demonstrated. Continuous cropping is still a current practice and the lessons to be learned will be for the future. However, if we become complacent about these systems and do not identify key ‘tipping points’ for sustainability, my experience is that narrow rotations such as continuous wheat-canola-wheat-canola will break down sooner rather than later. Sustainable intensification is a current practice and there will no doubt be lessons to be learned but at some time in the future. Natural Resources – what needs to be done? Adaptation to climate change – what needs to be done? Nitrogen efficiency – what needs to be done? Food loss and waste – what needs to be done? Rural communities – what needs to be done? the imperative of effective farmer participation in the research-development-adoption continuum.